The fight pitting Big Media against Big Cable is nasty, and instructive. In about two months, the Canadian Radio-television and Telecommunications Commission will announce its decision regarding the television broadcasters’ proposal to collect fees from cable and satellite providers for broadcasters’ over-the-air network signals. Will the regulators side with the cable companies, who argue the fee is nothing more than a TV tax that will add $10 a month to the average cable bill? Or will they go with the broadcasters, who claim the cable companies are not paying for local television services they already charge consumers for? Broadcasters like CanWest Global and CTV are hoping to pry $100 million a year from cable company coffers. The cablecos — Bell Canada, Shaw, Rogers — of course want to keep the money for themselves. To convince Canadians of the righteousness of their cause, each side set up front groups — Stop the TV Tax and Local TV Matters — and pumped hundreds of thousands of dollars into blanket advertising campaigns. The two sides appeared in Ottawa in a showdown before the CRTC in Nov. 2009 for four days of intense hearings. This high-stakes, shoot-‘em-down approach is not the way the cable-broadcasting duopoly usually does business. In the past, CRTC hearings were reminiscent of a famous scene in the 1974 movie Godfather Part II. About a third of the way through the film, mob boss Hyman Roth is celebrating his 67th birthday on a luxury hotel balcony in pre-revolutionary Havana. All the families are there, including Michael Corleone. Roth is cutting the cake, which has a map of Cuba on the icing. He cuts one piece and gives it to Corleone, another to Eddie Panino of the Panino brothers, and a third slice to “our friends” from Las Vegas. The country, with its lucrative hotel, prostitution and gambling activities, is being carved up. But Fidel Castro and his rebels are already coming down from the mountains and the partnership is short-lived. Roth and Corleone plot against each other, with Corleone emerging victorious when Roth is killed at an airport by Corleone’s capo who is disguised as a journalist. The CRTC is Canada’s Hyman Roth and Michael Corleone combined, doling out the cake to the broadcast and cable families. There is a “real partnership” between the families and government here too, but this is rarely talked about by mainstream journalists, most of whom work for one or another of the families. The CRTC has certainly been generous with slices of the cake. It allowed cable companies to raise their rates without having to apply for increases. As a result, a cable subscriber paid seven per cent more in 2008 than the year before, without any say in the matter. And to keep broadcasters happy, the CRTC removed the ceiling on the number of minutes of advertising a broadcaster could cram into an hour. The sky’s the limit now. Until the 2008 meltdown, the cake was large with lots of slices to dole out. Cable and broadcast families were on good terms, “duking it out behind closed doors for the biggest slice of the cake,” as American communication scholar Bob McChesney observes. “The public knows nothing about it. It doesn’t participate.” And then the regulator announces the backroom deal. But like Castro descending from the mountains, the Internet has wreaked havoc with traditional partnerships, drawing away eyeballs and advertisers. So with plummeting revenues, the broadcasters became desperate for new sources of income. Their plan was to hit the mattresses and take on the cable guys, who were still raking in the dough because their business model relies mostly on regularly increasing monthly subscription fees. In 2008 — the last year for which figures are available — cable TV revenue growth was 2.3 times greater than for television. It’s uncertain who will come out on top in this war. CRTC chairman Konrad von Finckenstein said at the outset of the hearings that he was “sick of not being able to find a resolution.” He berated both sides for being unable to resolve the issue on their own. Usually they can because, like Hyman Roth, both broadcasters and cable companies can boast about “real partnership” with the CRTC. In economic theory it’s called regulatory capture, when the regulator ends up acting for the industry it is supposed to regulate instead of the public interest, which it is legally mandated to protect. The line-up of commissioners adjudicating the cable-broadcast dispute provides evidence for regulatory capture theory. CRTC vice-chairman Michael Arpin worked in the broadcasting industry for nearly 40 years, including a stint as chair of the Canadian Association of Broadcasters, the industry lobby group. He’s balanced by the other vice-chairman, Leonard Katz, who is from the cable industry. Katz spent 17 years with Rogers and 11 with Bell, the two dominant companies in the Stop the TV Tax coalition. There are no vice-chairmen representing the public interest. Also on the panel are Rita Cugini, Ontario regional commissioner, who is from the broadcast sector, while Elizabeth Duncan, the Atlantic regional commissioner, hails from cable. Chairman von Finckenstein, who was appointed by the Harper government, is supposed to oversee the battle between the two sides, ensuring it is fair to both. He’s got the right credentials, as a former federal court judge and head of the Competition Bureau for six years. But what can he actually do when the “real partnership” with government is further strengthened by the legions of lobbyists — the foot soldiers — the industries employ to ensure they get the cut they want? The cable family has Andre Gourde, a former deputy minister of communications (the department that oversaw the CRTC), and Pamela Dinsmore, Rogers Communications’ chief in-house lobbyist, who for three years was chief of staff to the CRTC chairman and before that a CRTC legal counsel and acting director of the CRTC’s cable distribution directorate. They are countered, and perhaps trumped, by the broadcasters’ CRTC lobbyists such as Charlotte Bell, CanWest Global’s senior vice-president of regulatory affairs, who worked for ten years at the CRTC, ending up with a two year stint as special assistant and policy advisor to the CRTC chairman. The broadcasters’ heavy hitter, though, must be Wayne Charman, who was director-general of the Broadcast Distribution and Technology Branch of the CRTC before he went to work for the broadcasters. Both sides can command the ear of the Conservative government. Rogers relies on lobbyists like William Pristanski, who was prime minister Brian Mulroney’s executive assistant. Bell Canada employs the heavy-hitting Hill and Knowlton PR firm for much of its lobbying work. That’s where former Harper chief of staff Ian Brodie now hangs his hat. Two Hill and Knowlton functionaries who lobby for Bell have interesting connections: Michael Coates is a long-time Conservative who helped Harper prepare for the leaders’ debate during the 2008 election campaign; and Goldy Hyder was Joe Clark’s chief of staff and a volunteer in the 2006 Conservative election campaign. Broadcasters have their capos as well. One of Harper’s closest friends and advisers, Ken Boessenkool, lobbied for CanWest Global until July 2009. CTV Globemedia uses lobbying powerhouse Summa Strategies. Working on the file is Tim Power, a well-known Conservative insider who worked for John Crosbie, minister of Fisheries and Oceans in the Mulroney government. The Canadian Association of Broadcasters uses lobbyists from Earnscliffe Strategy Group. 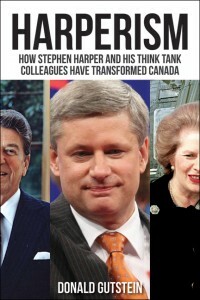 Yaroslav Baran was Harper’s director of strategic communication and Geoff Norquay his director of communication, when Harper was opposition leader. They joined Earnscliffe before Harper was elected prime minister, but both came back — Baran to direct Conservative Party media relations during the 2006 and 2008 election campaigns and Norquay to act as a prominent Conservative spokesperson. In the movie underworld, Corleone prevailed over Roth. In the Ottawa underworld, the script is still being written. First published by The Tyee.